ROISIN CONNEELY discusses the Romantic artists’ concerns for the natural environment, and how we can learn from them today. Romanticism is a literary movement which began at the end of the 18th century in Europe, and quickly spread across the globe. Its tell-tale themes are that of individualism, emotion and awe of the natural world. Its rise is often credited as a reaction against increasing industrialisation and urbanisation of the world at the time, which the Romantics believed threatened their beloved landscapes and wildlife and these fears emerge strongly in their writing. At a time when the environment is at risk more than ever, could we learn a thing or two about respecting nature from the heroes of Romanticism? When you think of Romantic poetry, William Wordsworth is a name likely to spring to mind. His poetry is in many ways characterised by feelings of isolation from an increasingly modern world. In the famous poem ‘I Wandered Lonely as A Cloud’ the speaker seeks refuge in the ‘vales and hills’ rather than an urban environment. Stumbling upon a ‘crowd’ of daffodils, Wordsworth personifies them as ‘dancing’ and ‘tossing their heads’, highlighting the connection he feels to flora and fauna, and how in tune he is with nature. In ‘The Tables Turned’ Wordsworth urges to ‘let Nature be your teacher’, advocating an appreciation for the real world as the true educator, rather than books or ‘sages’. He certainly has a point here: many of the greatest scientific advancements have come from simple observations of what animals and plants have been doing for millennia. Japan’s bullet train, for example, was modelled on the beaks of kingfishers, as a way to streamline the trains and make them more efficient. The majority of modern medicines have also been distilled from an array of plants, fungi and other natural substances. Nature has taught humanity a lot – but to ensure it keeps doing so, we need to protect and conserve it. William Blake, too, expresses dismay at the increasingly urbanised world that the Romantics found themselves in. 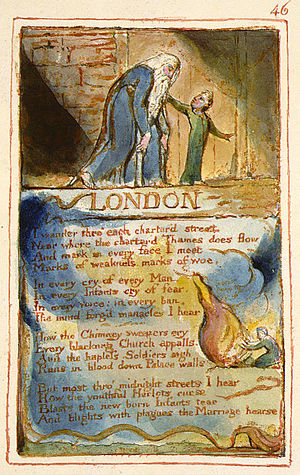 This idea is embodied in ‘London’, where the speaker despairs at the ‘marks of weakness, marks of woe’ he sees whilst walking down ‘chartered streets’ along the ‘chartered Thames’. The speaker suggests that human restrictions placed on street network and river have created discontent among those who live there. Similarly, in ‘New Jerusalem’ Blake mourns the loss of ‘England’s green and pleasant land’. He would surely turn in his grave if he heard the results of a 2015 satellite survey by the University of Leicester, which found that from 2006 to 2012, approximately 22,000 hectares of green areas had been transformed into ‘artificial’ sites, which for the most part featured new housing. The need for housing is of course pressing and important – but land is non-renewable, and losing these green spaces not only causes problems in terms of habitat loss and increased air pollution, but studies have actually shown that access to green, open spaces is a key factor in maintaining physical health. Improved mental health, reduction in cardiovascular disease and diabetes, as well as improved immune system functioning are just some of the benefits we gain from access to parks and forests. Perhaps Blake was right to fear the onset of urbanisation. The paintings of Thomas Cole also pay homage to the natural world. His breath-taking landscapes and scenery compliment the written beauty of Romantic poetry. Humans, when they appear, are tiny, insignificant figures, overshadowed by the beauty of the landscapes. Figures appear awestruck by the landscapes in front of them, and are often alone, denoting the sense of isolation and insignificance that the Romantics felt at the world around them. Cole seems to wish that the viewer reconsiders their role in the grand scheme of life. We are, after all, only one species sharing this planet with millions of other lifeforms. Like the people in his paintings, we are but a speck compared to the magnitude of the natural world; perhaps this is the core message of nature conservation. Charlotte Turner Smith is another Romantic poet fascinated with nature – only her preoccupation is with wildlife. In ‘To a Nightingale’, she immediately creates sympathy for the nightingale with the opening line ‘poor melancholy bird’. She longs to know why he is so miserable, asking ‘from what sad cause can such sweet sorry flow?’. Similar to many of her contemporaries, Smith was known for using her writings to escape into the natural world, often using birds to mirror her own emotions and struggles. In the increasingly urbanised world in which she was writing, Smith retains respect and admiration for nature and wildlife, and is able to seamlessly put herself in the place of the creatures she writes about. If we, in our modern age, could take a leaf out of her book and empathise with threatened animals such as the turtles choking on our plastic or orangutans losing their forest homes, then perhaps we would be more thoughtful in our approach to the wider ecosystem. Romanticism in many ways developed as a reaction against the increasing dominance of science, reason, industrialisation and urbanisation. The Romantics valued feelings, instinct and, perhaps above all, respect for Mother Nature. The ability to empathise with animals, to recognise the magnitude and power of the land, as well as a will to fight against greed and consumerism in order to protect natural flora and fauna, are all ideas that we could definitely borrow from the Romantics and put to use in the modern age. Maybe it’s time to make like a Romantic and fall in love with nature again. This article is published in our Environment in Arts series, raising environmental awareness in advance of UCL Climate Action Society’s Sustainability Symposium on 16th November. Find more information here. 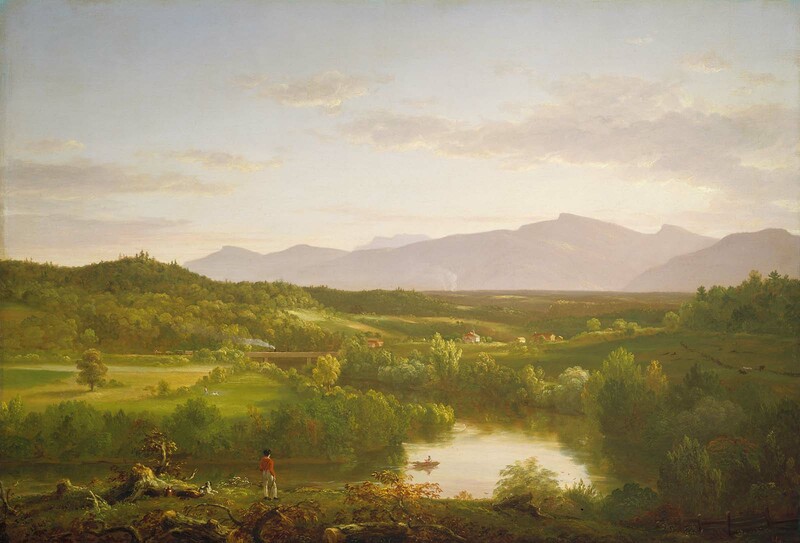 Featured image: The Oxbow, Thomas Cole, 1836.